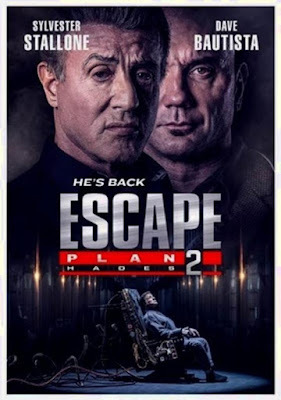 For some reason Sylvester Stallone has a real passion for Escape Plan, the forgettable 2013 prison thriller he starred in alongside Arnold Schwarzenegger. Maybe it's the $130M it made worldwide, mostly overseas, or maybe it's because he gets to be the face of a new franchise that isn't burdened by expectations, the way Rocky or Rambo are. Remember, Stallone pretty much ended The Expendables so he could focus on sequel Escape Plan 2: Hades, with an eye already on a third movie. So is all of his time and energy worth it? The new trailer for Escape Plan 2 is here and it actually looks better than the original. A bit part of the reason is swapping out Schwarzenegger for Dave Bautista, with the Guardians of the Galaxy star (he and Stallone co-starred in Vol. 2 together) bringing energy and physicality to the role of Trent DeRosa. Stallone returns as security expert Ray Breslin, who we last saw breaking out of an escape-proof prison of his own design. This time he's breaking into one in order to help a kidnapped teammate trapped inside a maze-like prison known as Hades. Steven C. Miller (Arsenal) is behind the camera, with Jesse Metcalfe, Jamie King, and 50 Cent co-starring. Escape Plan 2: Hades hits theaters and VOD on June 29th.